Ancient Stones - Lothian - 015 Loth Stone, Cairndinnis, East Linton. 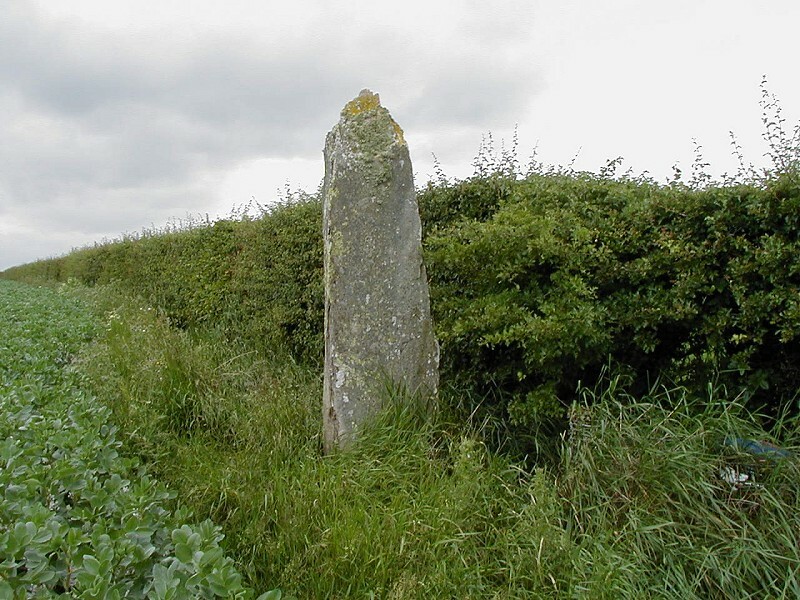 This standing stone, also known as the Loth Stone, is a four sided monolith, some 2.40m high and is located at a field boundary about 300m south-west of Traprain Law, although this is not it's original position, having been moved to facilitate ploughing. The area was excavated at the time but nothing was found. There are also records that stone coffins and a cist were discovered in the vicinity. From East Linton take a minor road for Traprain, continue south for Sunnyside, go straight on, then right and through Luggate. Standingstone Farm is the next set of buildings on the road. The stone can be seen along the field boundary in the direction of Traprain Law. Parking can be sought at Standingstone Farm, by permission. It is also an easy walk from the parking areas to the north of Traprain Law. The Loth Stone is said to mark the grave of King Loth, a fictitious? Pictish monarch who gave his name to the Lothian region. As the story goes, Loth lived in the area around 518 B.C. and had a daughter who fell in love with a local shepherd. Much displeased with this he had his daughter condemned to death by being thrown from the top of Traprain Law. However, being a hardy Scots lass, she survived the fall and while still unconscious was placed in a coracle and set adrift on the Firth of Forth. The princess landed at Culross and was saved by local shepherds. Some time later, she gave birth to a son, Kentigern who trained as a holy man and later took the name of Mungo. His travels too him to the west where he set up a monastery in the small village of Cathures, which was later to become Glasgow. Meanwhile, the shepherd who had originally fallen in love with the princess, took his revenge on King Loth and killed him with an arrow through the heart. Legend states that Loth's Stone marks the site of the burial. In 1861 Professor James Young Simpson examined the stones around Traprain Law in the hope of discovering King Loth's grave. Some 20m east of the original site of Loth Stone, a stone cist was discovered. An easy stone to get to this one. Just ask for permission to park in the steading at Standingstone Farm - note the other standing stone in the orchard - follow the tarmac road east towards Traprain Law. Take the signposted footpath north, then turn left and follow the hedge line to the stone. I always feel slightly disappointed that the stone no longer stands in it's original position.